Are you looking for the best led grow lights to help you with your gardening needs? Did you know that there are a lot of led grow lights today that you can use? Get to know how you can find the best one by reading the information below. If you are one of the many who is into indoor growing, then you are probably looking for the best led grow lights in the market today. The reason behind this is because of the benefits that you and your plants can get when using led grow lights. Now if this is your first time to purchase led lights for your plants, then knowing the things that you need to consider is essential. In this way, you will be sure that you are purchasing the right one. The first thing that you need to choose LED fixtures that have a cooling system since this installation needs to be cooled off as well. This means that you will need a fan and a heat sink for you to ensure that the LED can cool itself off if needed. A LED fixture does not typically radiate heat since they have a pad that is made out of metal, which will be the way for the heat to leave the fixture. The next thing that you need to do is to ensure that the LED grow lights that you are going to choose has an output spectrum that can be adjusted. This is helpful in managing the light that your plants need. For instance, you can match the output spectrum to summer time or the season of flowering. If your LED has an adjustable output, then you can help stimulate the light changes to ensure that it matches the plant’s growing cycle. When you are choosing your LED grow lights, it would be best to consider choosing one with an electronic circuit, which will help power the LED lights. The role of the circuit it to help transform the power of AC to direct current within the current level and proper voltage that your LED can handle. An appropriate circuit should be able to provide a consistent supply of the intensity to be regulated based on the changes of temperature. The LED with an MCPCB or the metal core printed circuit board is essential for your LEDs to use especially if you need higher levels of power for your plants. The MCPCB is a technology for certain electronics that will help your LED lights to operate at higher temperatures. The heat sink is where you are going to mount your circuit board and choosing one that has a lot of fins will help spread the heat faster to ensure a more rapid cooling as well. Choosing several fins is essential as this will also contribute to prevent future failures that are caused by a single set of fins, which will lead for your LED fixture to be damaged and to overheat. For people who don’t know, exposing your indoor plants to light will help their growth to accelerate while aiding in the process of photosynthesis. Another advantage is that it will help you control the light needed by your plants, so you don’t over do it. Let’s talk more about their advantages below. One of the advantages of using a LED grow lights is their long lasting life. The reason behind this is because they have the ability to serve your plants for 50,000 to 100,000 hours of use before they start dying out. Other types of light will only last 20,000 hours, which is not ideal since you will end up purchasing a new one again. This is the reason why LED lights are reliable and are perfect for growing plants since they won’t try to warm your room too much, which can expose your plants in an unhealthy environment. Another advantage that you can get from using this type of lights for your indoor garden is that they are known to be energy and power efficient. They can help you in saving more energy since they are not just a good source of light, but they are reliable as well. Also, they can help you save money since they can reduce your electricity bills substantially. Since the lights have LED technology, it will then allow a fine tuning to help produce better lights for your plants to be able to develop and grow. The reason behind this is because the LED’s energy can be adjusted to specific frequency bands, which means that you won’t be wasting energy in producing light in the wrong spot of the spectrum. Using LED grow lights mean that you can make use of the other spaces in your grow room. The reason behind this is because they are typically just small lights that do not need more space than other types of lights. There are also LED lights that can be chained together, which will help in eliminating those extra cords. Above are all the advantages of using LED grow lights that you will inevitably experience once you purchase the one that you will use for your indoor gardening. Now that you already know how to choose one and the advantages that you can reap out of them, then knowing the best LED grow lights available today is essential. 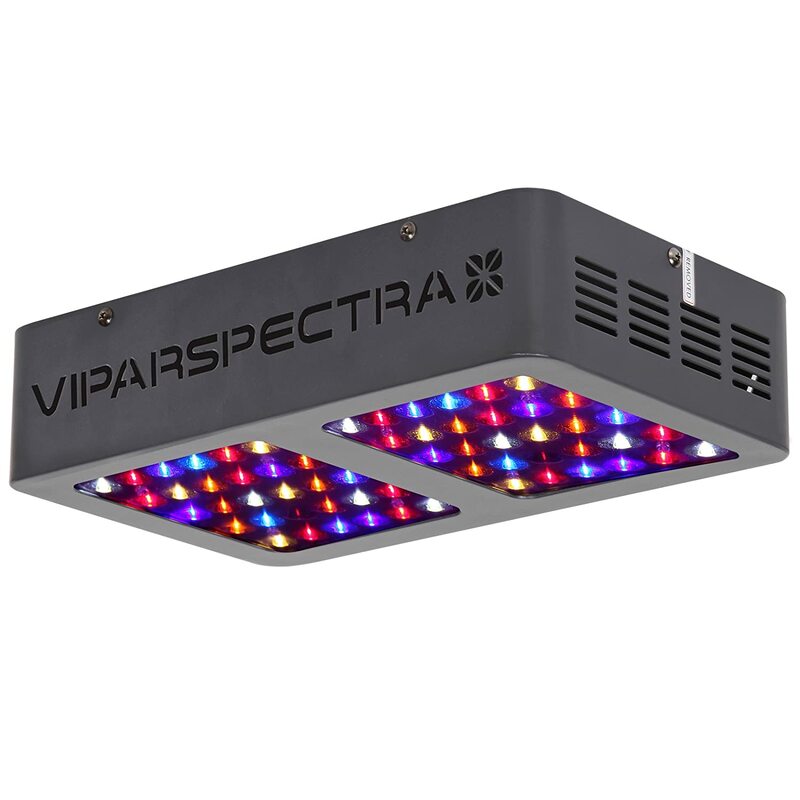 VIPARSPECTRA Reflector Series-300W is efficient, light, and compact, which means that it can be used no matter what you are growing. The output of the high lumens is engineered perfectly to ensure that it won’t produce too much since PAR is essential to the growth of the plant. The panel of the VIPARSPECTRA has 12 band panels of spectrum light from 440 to 730, which is known to optimal photosynthesis of the plant. The VIPARSPECTRA Reflector Series-300W is known to be energy efficient because the LED grows lights is using a lighting HPS systems. These systems are essential to ensure that the growth of your plants especially when planting indoors. 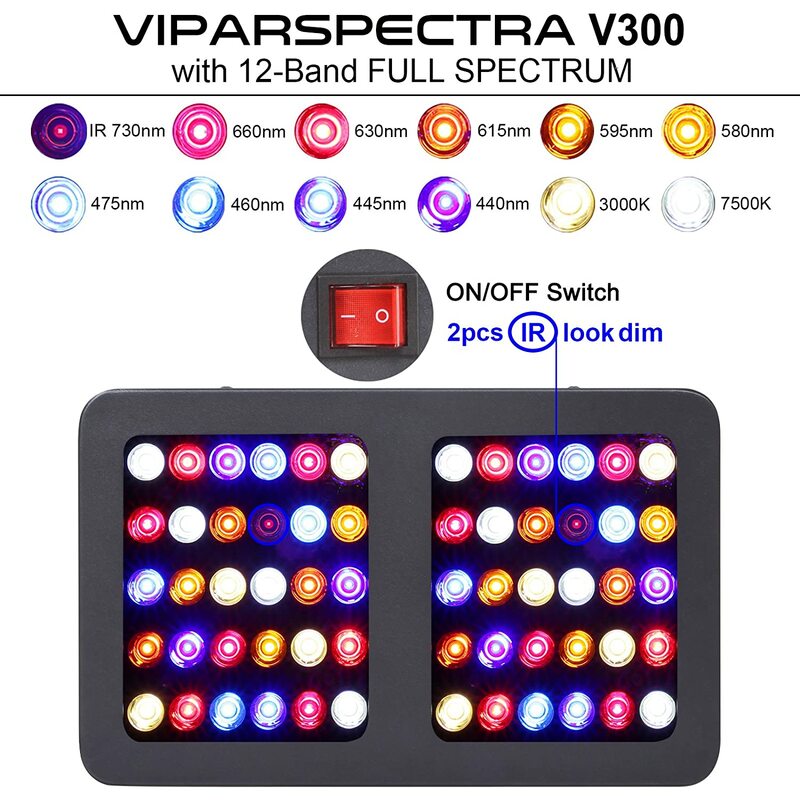 Another good thing about the VIPARSPECTRA is that it has a chaining fixture which means that if you are planning to expand your indoor garden. King Plus 1000w Double Chips LED Grow Light Full Spectrum is known to have powerful and high-quality lights at a very low price. This LED grow light uses a high-quality light source of 6W. Its lifespan can last for over 50,000 hours, and 90% of the produced light will always be absorbed by the plants that you have. 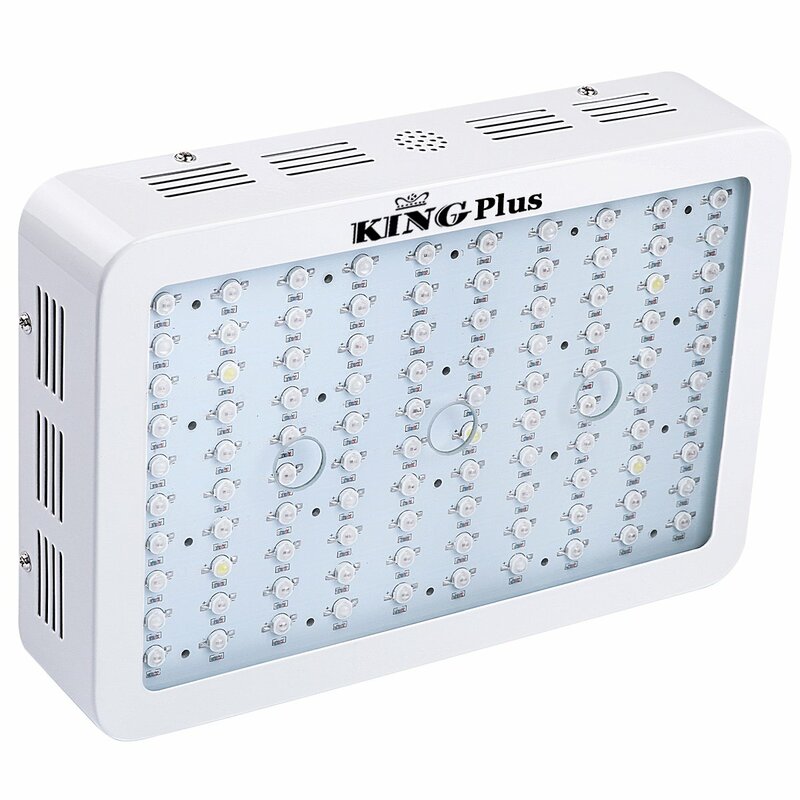 The King Plus LED grow light is also known to have an energy saving feature, which will only consume 320 watts to 340 watts of power, while it is still providing the needed brightness for your plants. The King Plus 1000w Double Chips LED Grow Light Full Spectrum’s color ratio has carefully been studied to ensure that it is replication the sunlight. This includes the UV, IR, white, yellow, blue, and red colors. The infrared that this lighting has helped in promoting seed germination and stem elongation. Another good thing about the UV is that helps lessen the plant diseases and as well as the bacteria. Advanced Platinum Series P150 150w Band LED Grow Light offers the best when it comes to spectrum. This LED grow lights consumes 50 watts of power and does not produce excess heat. The light that is provided by Platinum is used 100% and is tuned specifically to the wavelengths that are needed by the plants to enhance the process of photosynthesis. The Advanced Platinum Series P150 150w Band LED Grow Light is perfectly equipped with 90 degrees of secondary lenses and a 60 degrees lens. The aluminum heat cooling sinks that it has equipped with twice the speed but produce little to no noise at all. Another good ring about this LED grows lights is that it perfectly blends with 11 bands of spectrum. 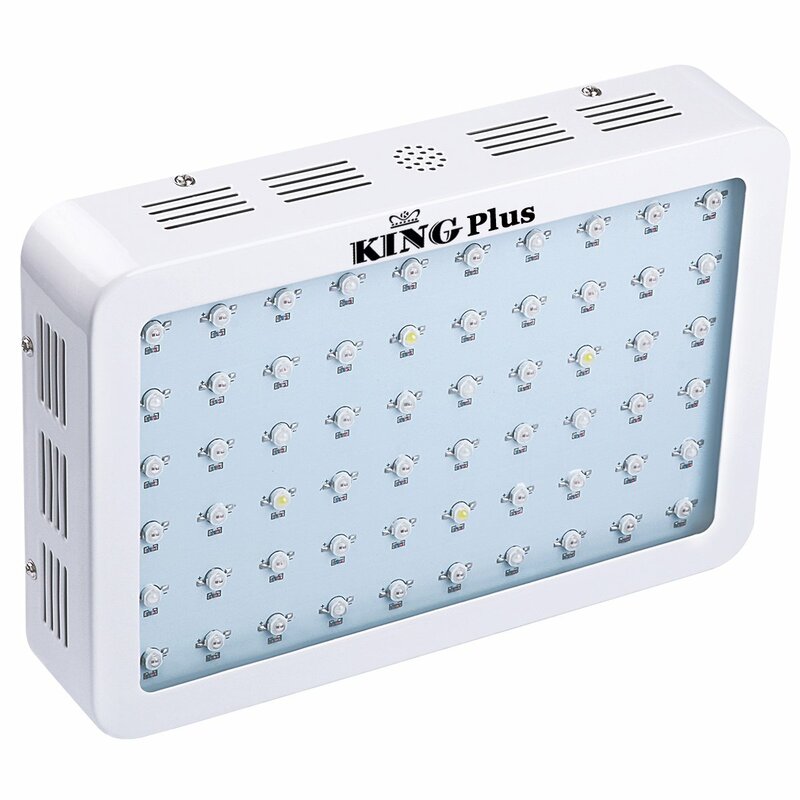 King Plus 600w Double Chips LED Grow Light Full Spectrum is equipped in a white case and an assortment of even diodes and place in the grid pattern. These diodes are not the usual that you can see in a LED grow light because they are known as the double chips. This means that they can produce brighter lights compared to others. Instead of the single 3W diode, the King Plus has two 5W diodes in just a single chip. The King Plus 600w Double Chips LED Grow Light Full Spectrum panels have different heat sinks, which will ensure that their temperature will remain in the ideal range. As you all know, proper cooling is important, which is why the King Plus have different entries for ventilation, which helps in the airflow while they are operating. 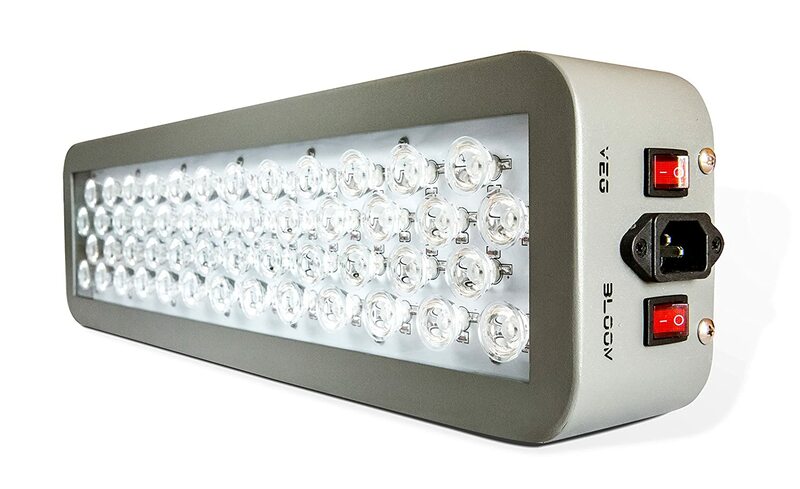 Galaxyhydro LED Grow Light, 300W Indoor Plant is equipped with IR and UV. 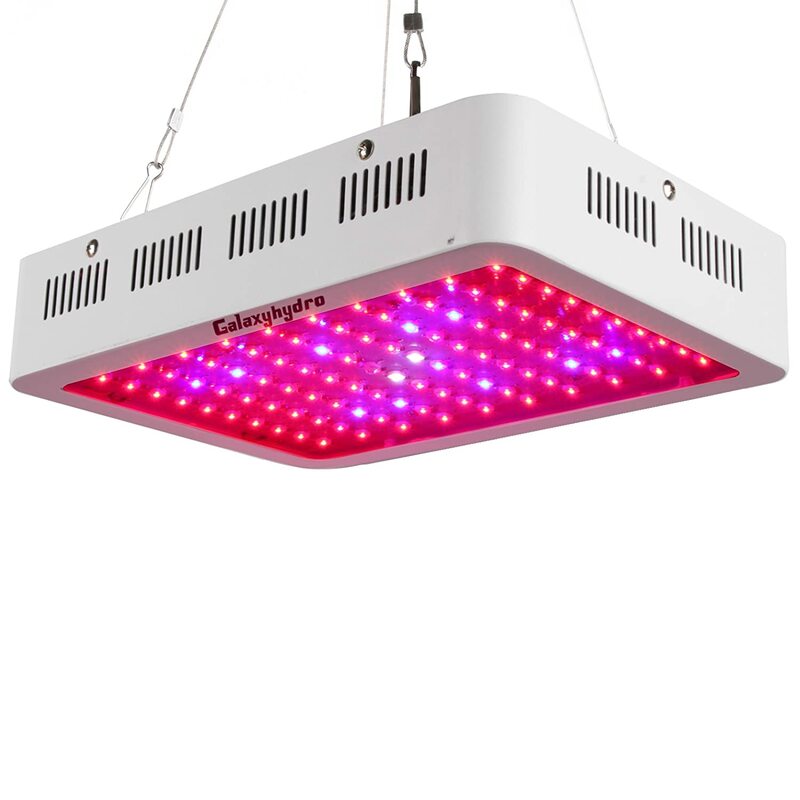 Since there are more red lights in this LED grow light, this means that it can help with the photosynthesis, which is ideal for plants that are fruiting and blooming. The Galaxyhydro helps on the fruiting, flowering, growing, and seedling stage of the plant, for you to ensure that they will grow successfully. The Galaxyhydro LED Grow Light, 300W Indoor Plant is also equipped with the largest number of light per watt, which will help your light to last for a long period. It will also assist you in saving money when it comes to your electricity bills. Another good thing about the Galaxyhydro is that it has 2 cooling fans to ensure that the light is in lower temperature even if it is working for how many hours every single day. This will also help the light not to burn, which is a common problem for some. Above is all the information that you need about the best LED grow lights that you can purchase for grow room. Of course in every review, there will always be one that will stand out from the rest. For this review, VIPARSPECTRA Reflector Series-300W is the one who stood out. The reason behind this is because it has a full spectrum and 5 diodes, which can help in assisting your plants to grow well. The daisy chain capabilities that it has will also let you add more lights if needed, especially if you decide to expand your grow room. No matter what LED grow lights you choose, always make sure to pick the one that will provide your grow room and the plants that you have the help for them to be able to grow well.